Definition at line 485 of file CMetab.h. Definition at line 997 of file CMetab.cpp. Definition at line 1005 of file CMetab.cpp. Definition at line 1013 of file CMetab.cpp. Definition at line 1015 of file CMetab.cpp. Definition at line 1075 of file CMetab.cpp. Definition at line 1017 of file CMetab.cpp. 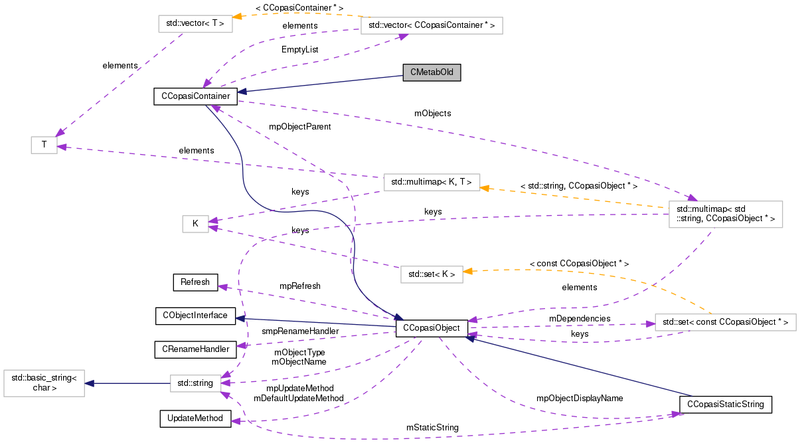 References C_INT32, CModelEntity::FIXED, CCopasiObject::getObjectName(), CReadConfig::getVariable(), mCompartment, METAB_MOIETY, mIConc, mStatus, CModelEntity::REACTIONS, CReadConfig::SEARCH, CCopasiObject::setObjectName(), and CCopasiMessage::WARNING. 1056 "The file specifies a non-existing type "
1066 "The file specifies a negative concentration "
Definition at line 487 of file CMetab.h. Index of the compartment the metabolite is located in. Definition at line 506 of file CMetab.h. Referenced by getIndex(), and load(). Definition at line 495 of file CMetab.h. Referenced by load(), and CMetab::operator=(). Status of the metabolite. One of (METAB_FIXED, METAB_VARIABLE, METAB_DEPENDENT, METAB_MOIETY). Definition at line 501 of file CMetab.h.